This week was the presentation of the Ashaded View on Film Festival that will take place in Milan on May. This festival is organized by Diane Pernet, journalist and blogger - a Visionaire, being one of the first ones to believe in the video has a way to communicate fashion. The presentation took place in Corso Como 10 with a cocktail, in the format of video installation. Diane Pernet and Michael Nyman that will present "The Cleaners wear Prada" on the festival. This week two big surprises regarding cakes. 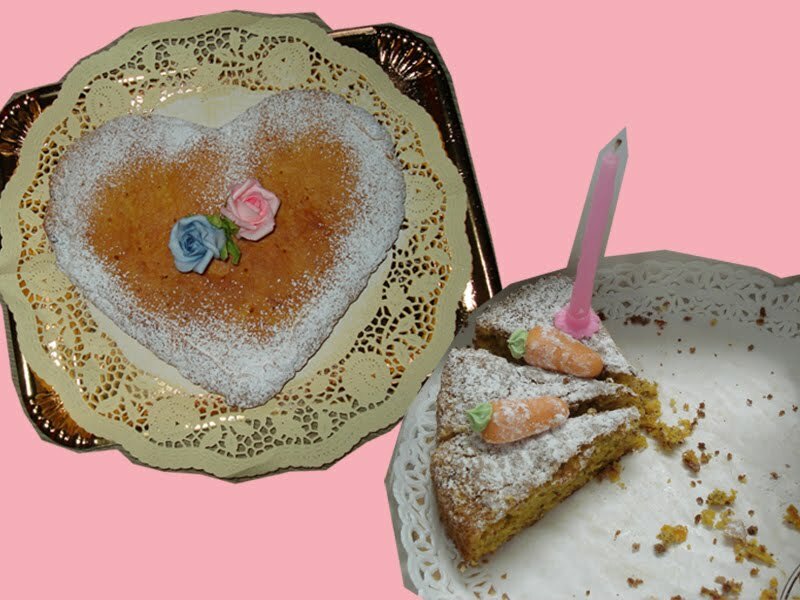 On the right a birthday cake with small carrots offered by Letitia, Anna and Alessandra from the place I'm working on, that wanted to celebrate my birthday has they discovered by chance that my birthday was 3 weeks ago. Grazie Mille. On the left a cake ofered by the door woman from the "palazzo" where I live. I could not believe when she came to deliver the cake. It's so kitsch! But it's so good with pear and chocolate inside and it's crispy. Grazie Nicoletta. A gente ja ta a fazer a dieta.